Buy now on DVD ($14.96) or Blu-ray/DVD Combo Pack ($19.96) from Amazon. "Action icon and Academy Award® nominee Harrison Ford (Indiana Jones franchise, Star Wars franchise, Best Actor, Witness, 1985), Asa Butterfield (Hugo), Academy Award® nominee Hailee Steinfeld (Best Supporting Actress, True Grit, 2010), two-time Academy Award®nominee Viola Davis (Best Supporting Actress, Doubt, 2008; Best Actress, The Help, 2011), Academy Award® nominee Abigail Breslin (Best Supporting Actress, Little Miss Sunshine, 2006) and Academy Award® winner Ben Kingsley (Best Actor, Gandhi, 1982) star in the epic adventure Ender’s Game, arriving on Blu-ray Combo Pack (plus DVD and Digital HD UltraViolet), DVD (plus Digital UltraViolet), Video on Demand and Pay-Per-View February 11thfrom Summit Entertainment, a LIONSGATE company. The film will also be available on Digital HD January 28, two weeks prior to the Blu-ray Combo Pack and DVD release. Based on the award-winning best-selling novel by Orson Scott Card, and written and directed for the screen by Gavin Hood (Rendition, X-Men Origins: Wolverine, Tsotsi), Ender’s Game is a visually stunning and thrilling film that has been 28 years in the making. In the near future, a hostile alien race called the Formics has attacked Earth. If not for the legendary heroics of International Fleet Commander Mazer Rackham (Kingsley), all would have been lost. In preparation for the next attack, the highly esteemed Colonel Hyrum Graff (Ford) and the International Military are training only the best young children to find the next great leader. Ender Wiggin (Butterfield), a shy, but strategically brilliant boy is pulled out of his school to join the elite. Arriving at Battle School, Ender quickly and easily masters increasingly difficult war games, distinguishing himself and winning respect amongst his peers. Ender is soon ordained by Graff as the military's next great hope, resulting in his promotion to Command School. Once there, he's trained by Mazer Rackham, himself, to lead his fellow soldiers into an epic battle that will determine the future of Earth and save the human race. 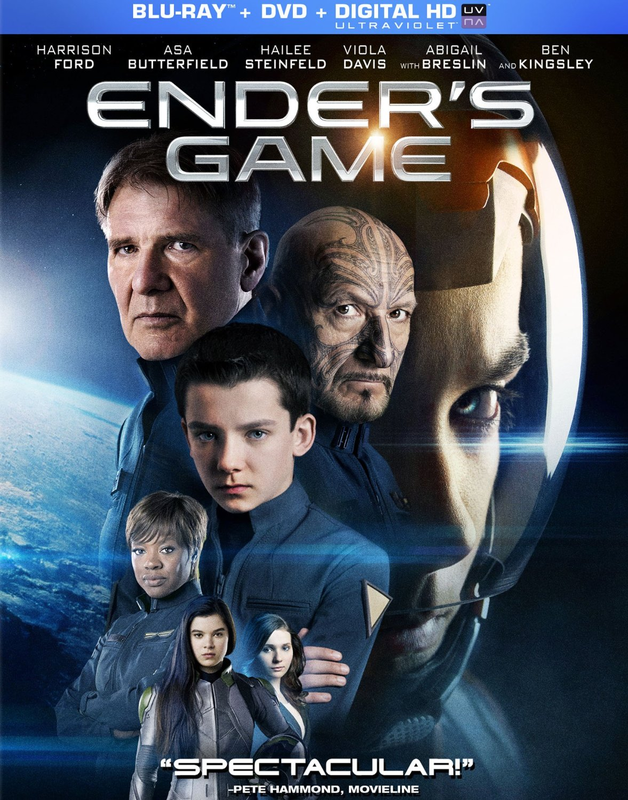 The Blu-ray Combo Pack bonus materials include an exclusive 45-minute “making of” featurette called “Ender’s World: The Making of Ender’s Game” and “Inside the Mind Game,” a look at the motion capture process used in the film. Both the Blu-ray Combo Pack and DVD special features include deleted and extended scenes with optional audio commentary with director Gavin Hood as well as a feature-length audio commentary with Producers Gigi Pritzker and Bob Orci and a second feature length audio commentary with Director Gavin Hood. The Ender’s Game Blu-ray Combo Pack and DVD will be available for the suggested retail price of $39.99 and $29.95, respectively." Thankfully, before we lost power the other night from the snow and winds, my husband and I had just finished watching "The Ender's Game." Wow, what a great movie this was. I would have liked it either way seeing that it had Harrison Ford in it, but the whole story line really pulls you in and keeps you engaged from start to finish. While I am not one for sci-fi type movies, I did find myself enjoying the plot. An alien race known as the Buggers which tried twice before to take over Earth and kill everyone and everything. It isn't until 50 years later that the people on Earth have to join forces to protect themselves and those they love. Will they be successful and finally rid the world of the Formics? If I ever found myself having to to ward off alien dangers, I would definitely want Harrison Ford on my side. :-) The whole movie deals with the theme of survival and having to word together as a team to save Earth. In addition to Harrison Ford, this movie also stars Ben Kingsley, Abigail Breslin, Asa Butterfield and Hailee Steinfelt. I couldn't have chosen a better cast for this sci-fi flick, and loved how well the cast worked together. Harrison Ford plays Colonel Hyrum Graff, who along with his military group train tweens/teens, so that when the alien race, The Formics, make another attempt to take over Earth, this new team of highly trained military will be ready. If you liked the movie War Games from the 80's, then you will love this movie, as it has a similar feel, with simulations and video games used to train the cadets. This is the part I loved most about the movie -- the whole wartime strategy training. After watching this movie, I told my husband that I wanted to pick up the book this movie was based off of by Orson Scott Card. I love comparing both the book and movie, and see the differences and similarities between the two. Oftentimes what you read in the book doesn't make it to the screen, which gives you another spin to the storyline. Have you read the book yet? How about seen the movie? I would love to hear your thoughts on how they compared? My husband and I can't wait to watch the bonus features, which include audio commentary and an eight part featurette that explores how this movie was made -- always fun to see the behind the scenes and special effects that make the movie come to life on the big screen. While my husband didn't think we would like this movie as much as we did, seeing that it was full of teenagers, we were pleasantly surprised, and will definitely be watching it again soon. While this movie is rated PG-13, I would recommend it to teens and above, as it does contain violence and foul language. This is definitely one of the best good vs. evil sci-fi movies I have seen in a while, and one that I would recommend to family and friends. I can't wait to see this one I love Harrison Ford and all of his movies. I'm glad you were able to see the ending before your power went out. Crazy weather everywhere this Winter. Thanks for another great review I love your blog so much and come to it daily.